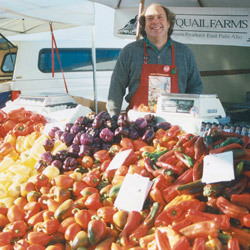 David Winsberg of Happy Quail Farms talks about growing his business at the Ferry Plaza Farmers Market. I started selling at the market during its first year. There were only a few markets around the Bay, and I had been selling mostly in Palo Alto, but it was a limited market. As a single-product, small farm, what was great about the Ferry Plaza Farmers Market was that we could grow and sell unusual products, like our specialty peppers, and people would buy them. In the City, the chefs and shoppers are plentiful and cognizant of what makes our produce different. A lot of our customers have been here right from the beginning, and over half of our daily business is with our regulars. Part of what’s fabulous about the Ferry Plaza is that it has become an artisanal market. Everyone is at the top of their game, and that’s really valued by the shoppers. The market also has a strong feeling of community. My kids pretty much grew up here. My customers may just know me as “the pepper guy,” and I recognize their faces even though I might know all of their names, but there’s a consistency that you don’t get anywhere else. That’s what the farmers market is all about. We are literally standing behind our product every day.